This will be a recurring theme on my blog. I’d like to introduce you to some of the amazing sights that we have missed out on simply by being born too late. If I had a Tardis, these would be the places I would visit…. 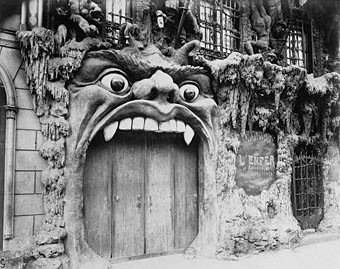 L’Enfer was an infernal hell-themed establishment, with a heavily sculpted demonic facade. 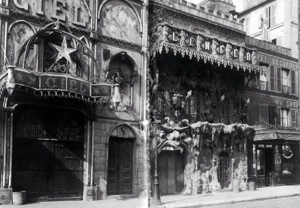 It opened in the late 19th century in the fashionably seedy red light district of Paris and rivalled the Moulin Rouge in attracting the dangerously decadent young set of Paris. 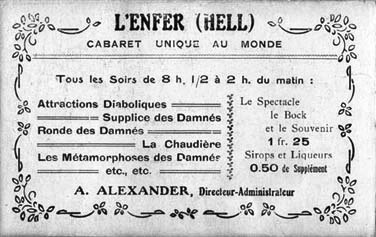 The scandalously rich and glamorous young Parisians who managed to secure admission to L’Enfer enjoyed devilish drinks and even more devilish company. The clientele spent evenings with many “attractions diabolique” but, as the evenings were deeply clandestine, little is known about what this entailed. 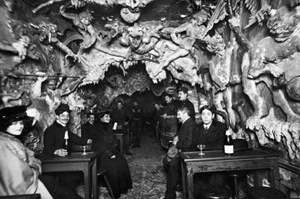 It is known that the waiters were dressed as devils, and the doorman (Satan, of course) welcomed members with a cheering “Enter and be damned!” The interior was elaborately constructed to resemble the pit of hell with demons and tortured souls reaching out from the ceiling to those seated below. Those who entered were warned (by capering imps dressed in scarlet) that the heat inside the inferno would make them thirsty, and so they should be prepared to drink well…and be wicked. By the early 20th century the Cafe had vanished, the facade stripped and never found again. A few fragments remain from the interior and can be found at the Musee de la Magie in Paris, but the rest is confined to whispers and stories. What happened at L’Enfer, stayed at L’Enfer…. This entry was posted in General, History, Mysteries, Travel and tagged demonic, Dr Who, fin de siecle, l'enfer, lost buildings, macabre, mystery, Paris, tardis, time travel, unusual.